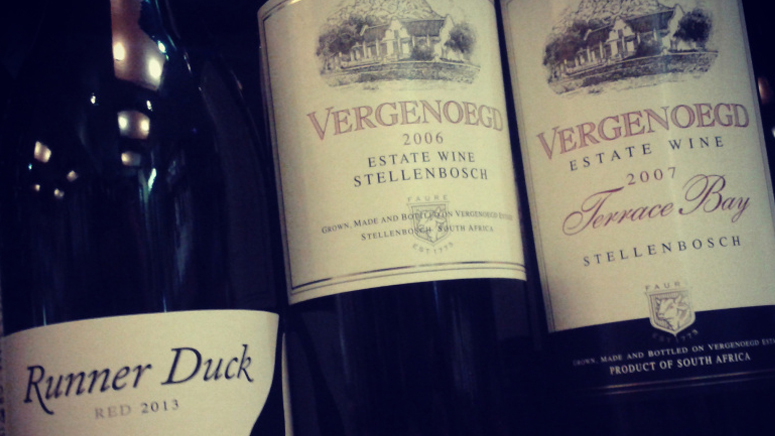 Southey’s Wines visited Vergenoegd today and share their experience in a fascinating read! Far off – in the opposite direction of the usual wine route – sits a charming estate with a captivating scenery; a comforting quietness and only about a thousand ducks for guests’ amusement. As we arrive – barely on time – we are welcomed with a chant of duck-callings from meters away. 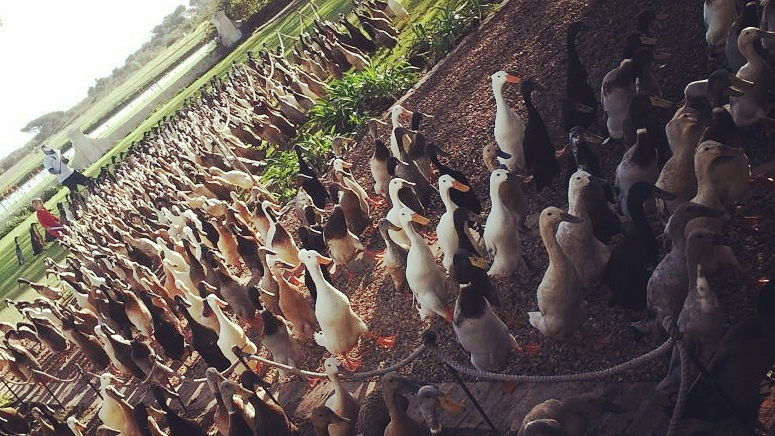 Thousands of runner ducks are slowly, and with great difficulty, led to the vineyards for round two of their daily meal. 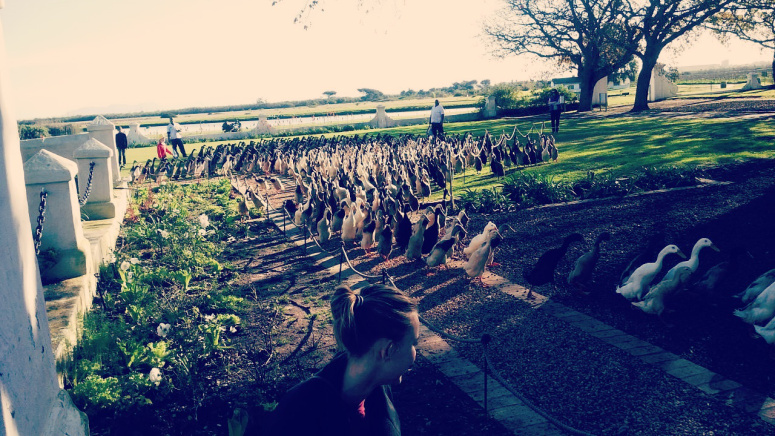 Thankfully we were in time to witness one-thousand and seventy ducks pass right by our feet as they prepare to rid the vines of any pests. The story goes, that many years ago, when the winemaker’s son was young, he was troubled by the amount of pesticides being used on the vineyards. 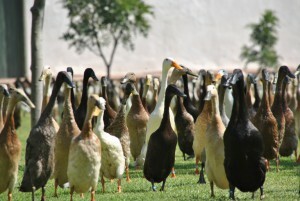 He planned to breed with runner ducks as an alternative to keeping the pests and insects at bay. More than 30 years and a thousand duck later, this alternative method is still being used. Not only is it such a brilliant pest-control approach, but it manages to draw so much local attention as something to witness. It should, without a doubt, be something to put on your bucket list. After the ducks had passed and the excitement settled a bit, it was time to choose a seat to place out our alcoholic-amount of wine for tasting. Today, only red wine. Which was perhaps best, since the winter breeze was still harsh and the sun was incompetent. So, we needed something to warm us a little. What better than wine from one of the best estates around. There was constantly this hoover of an Italian feel around us. Our little wooden table and chairs were conveniently located in the middle of their lawn, under a huge, bare tree. The entire setting made it seem like for this moment, we were in a foreign land. We were introduced to the wine that we would be tasting and wasted no time. They produce everything from single cultivars to stunning blends. Their entry level wine, they named The Runner Duck. No other name would be more suited. This range – with a runner duck on the bottle – would catch your eye on any shelf in a store, and remind you of what a majestic place this is. The vast patch of grass around the tables and chair is perfectly suited for kids to play and enjoy themselves as much as the parents who came for the wine. The estate is suited for both the enjoyment of children and adults – something few others manage. The building where the tasting room and gift shop is, was a typical old-style, farmhouse building. The wooden floorboards creaked with every step. In my mind, the building resembled the oak barrels that they used for the wines. The smell and feel of the building – everything built on this image of the creation of such good wine. Our decision to stock their wines came easily. Top class wines should be stocked in our shop. As we ended the tasting, with the sun hanging just above the ducks’ pond, some geese passed by. They were also being led to a certain location. They weren’t nearly as many as the ducks, but managed to make double the noise. What a way to start and end the visit to the estate. Begin with a parade and end with one. Vergenoegd will definitely see us again. Thank you for connecting with Vergenoegd via our website! It’s always best to get here at least 10 minutes before the time to be comfortably grounded on the Vergenoegd lawn! Let us know if you need any further info!